U.S. commercial auto insurance remains a trouble spot for carriers even with ongoing attempts to reverse stubborn underwriting losses, Fitch Ratings said in a new report. As a result, Fitch is maintaining a negative outlook for the sector, though the ratings agency said that most U.S. commercial lines writers individually have a “stable” rating outlook. “Commercial auto insurance is a relatively small line at 13 percent of commercial lines industry net premiums, but remains problematic despite numerous rate increases and underwriting actions,” Fitch said in its sector update. Fitch’s report notes that the segment has produced seven consecutive years of underwriting losses. The worst so far may have been in 2017, when the sector’s combined ratio rose to a 16-year high of 111.1. 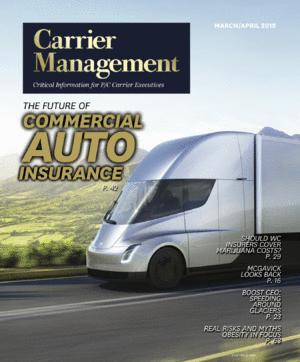 Why does U.S. commercial auto insurance remain such a money-loser? Fitch explains that a number of trends are in play, with unfavorable claims experience as one of the biggest. Insurers, undaunted, are investing in additional data analytics technologies, telematics and other improvements to manage these claims better and boost pricing/risk selection abilities, according to the Fitch report. Beyond loss severity trends, Fitch also points out that further loss reserve deficiencies continue to be a problem. “Prior-period loss reserve deficiencies continue to affect commercial auto insurer profitability, reflecting unexpected claims inflation and poor underwriting and pricing,” Fitch said. In a small bright spot, the report added that the while U.S. commercial auto dealt with unfavorable calendar-year development in each of the last six years, the rate slowed a bit in 2017 to 5.7 points on the loss ratio, versus 8.6 points in 2016. Fitch does point out other improving trends. While the commercial auto liability accident-year loss ratio is still high, it has slowly declined over the past four years. In 2017, the number was just under 78, from 80.5 in 2013. There’s a long way to go, however, as Fitch said the accident year loss ratio would need to dip below 70 before commercial auto can achieve break-even underwriting results. Not to be forgotten, commercial auto insurance premium rates continue their robust growth, Fitch said, which could also help turn things around eventually.